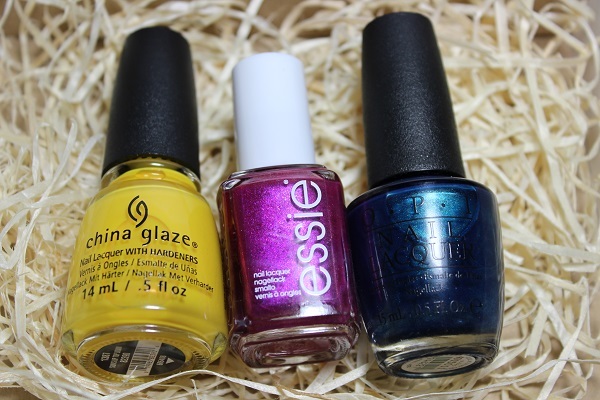 Coloristiq Rent Nail Polish, a subscription service where you rent nail polish! When the lovely people at Coloristiq asked me if I’d like to review their service, to be honest my first reaction to renting nail polishes wasn’t a positive one. I know, like me I guess you’re struggling to get your head around the concept! But when you break it all down, how many of the following apply to you? Do you have a stack of nail polishes (like me) that you don’t use anymore? 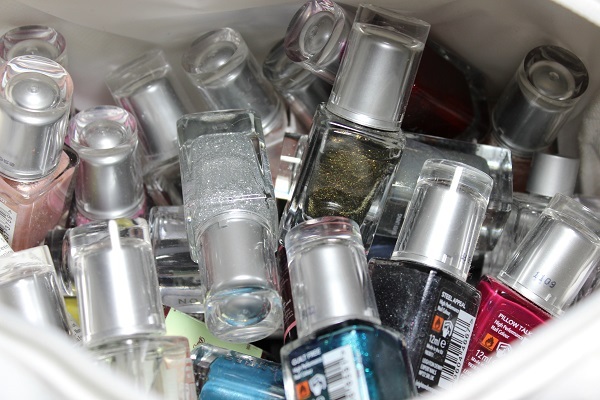 Can you remember ever using up a whole bottle of nail polish? (I can’t!). I am sure that some or all of the above apply to most of you lovely ladies reading this! So that’s where Coloristiq comes into its own! 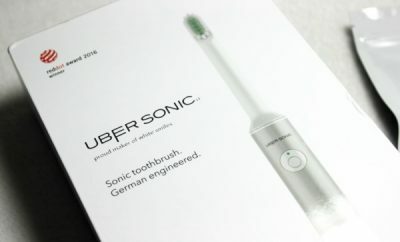 The UKs first, multi brand, online rental service launched in October 2014 that provides a monthly subscription where you can try before you buy! 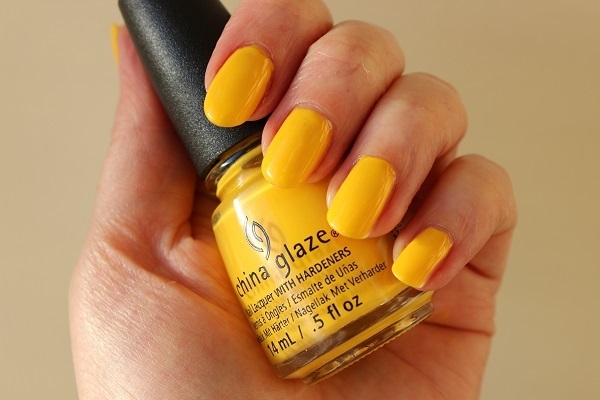 Rent the nail polish first and see if you like it first before you purchase it! You register with Coloristiq and agree to the monthly subscription cost of £14.49. Once you are registered as a member you set your own ‘wish list’ where you choose form over 170 salon quality nail polishes including Essie, OPI, China Glaze and Morgan Taylor. Three nail polishes from your wish list will then be sent to each member who can use them for nine paintings (three per bottle) for 30 calendar days. 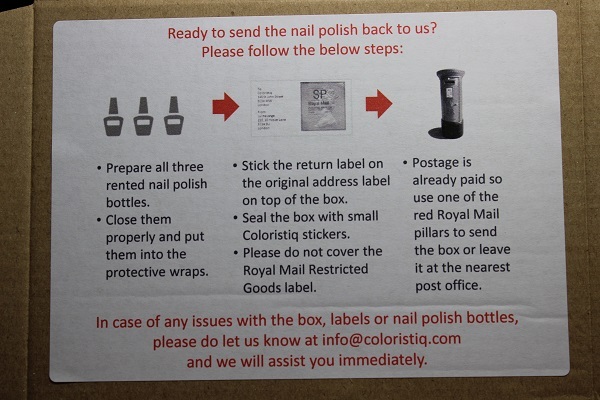 You then follow the instructions on the card/inside of the box they came in to return the polishes to Coloristiq free of charge using the return label provided. 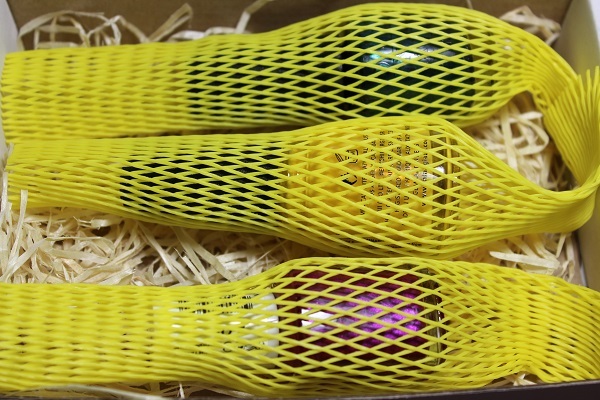 Once the bottles have been returned, the next three shades will be on their way to you. This service is only valid in the UK. You can only open an account if you are over 18 years of age. You rent the nail polish from Coloristiq, if you want to buy the polish then you will have to buy from a supplier that stocks that brand. 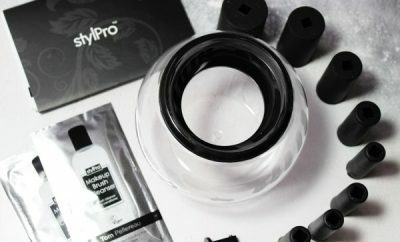 Bearing in mind I had no ‘wish list’ and the polishes I received to review the Coloristiq service were hand-picked by Coloristiq, how did I get on? Firstly, this is how the package arrived and this is how you must return them, so don’t throw away the sleeves! I must admit, it felt a little bit like Christmas because I didn’t know what I was getting! First feelings, out of the three colours I knew one of them would have been on my wish list had I made one, can you guess which one?! One of them, I would never have chosen for myself but after application, I changed my mind! The final colour, I wouldn’t choose at all. My skin/hair colour dictates to me that this colour just doesn’t suit me, but I did give it a go! So how did I get along with the colours that were sent to me? The Lace Is On, I absolutely loved! The applicator was fabulous for perfect application and it didn’t chip for nearly two weeks! I even cleaned the car and no chips! I got so many positive comments and I did feel really confident wearing it. Together wearing some lovely rings, expressing myself with my hands, my nails painted in this flamboyant shade made me feel I had made an extra special effort to show people I do look after myself. I would definitely buy this brand and shade again. Yodel Me On My Cell, I wasn’t sure about at first but on application the consistency was great and I got excellent coverage. I will wear it again but I’m not sure I would buy the bottle again, I do however love OPI. Sun’s Up Top Down, really isn’t my colour. I’m too paler skin tone and I have blonde hair, but the consistency was great and I got fabulous coverage. For me, this shade would look fabulous on darker skin tones but as I’ve said already I had no wish list and these colours were just randomly sent to me. What I can say is that all three colours are from recognised salon quality brands. Your Coloristiq membership is about you trying out top notch brands of nail polish that some of you may not have tried before. You will see the difference with the quality, how the polish sits on your nails and also how long you go without the polish chipping. However, I would advise that to get the best results always use a base/top coat and ensure you paint your nails with two thin coats, letting them dry properly between applications. For me this is one of those ideas that you think won’t work, but it does! I’ve already decided that when I run out of The Lace Is On, I’ll be buying another bottle! 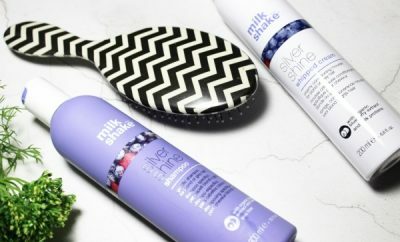 Try before you buy ladies, Coloristiq is the way to go!